The other day we found a traditional sandwich in a London pub. Not in some far corner of the east end but at a pub in Mayfair. There it was on their lunch menu – honey roast ham, cheddar tomato and pickle. And on real handcut bread, not sourdough or ciabatta and not sawn from one of those artisan loaves that a dog could use as a chewtoy. Accompanied by two pints of beer and a serving of chunky chips it was the perfect way to end a morning exhausting ourselves at the Royal Academy Summer Exhibition. Sandwiches have come a long way since the eighteenth century when the 4th Earl of Sandwich is alleged to have ordered his valet to bring him meat tucked between two pieces of bread. so he could carrying on playing cards without using a fork. History could have been very different if it had been the other way round. Anyway the story goes that fellow toffs were so taken by the idea that they began to order “the same as Sandwich”. In 1851, the Victorian social commentator Henry Mayhew calculated that 436,800 sandwiches, all of them ham, were sold on the streets of London each year. That might sound a lot, but Sainsbury’s (with 4% of the sandwich market) now sells that number every 36 hours. Things didn’t get much further for well over a century. The British Rail sandwich with its curling edges is one of the downsides of having an unprivatised railway system. 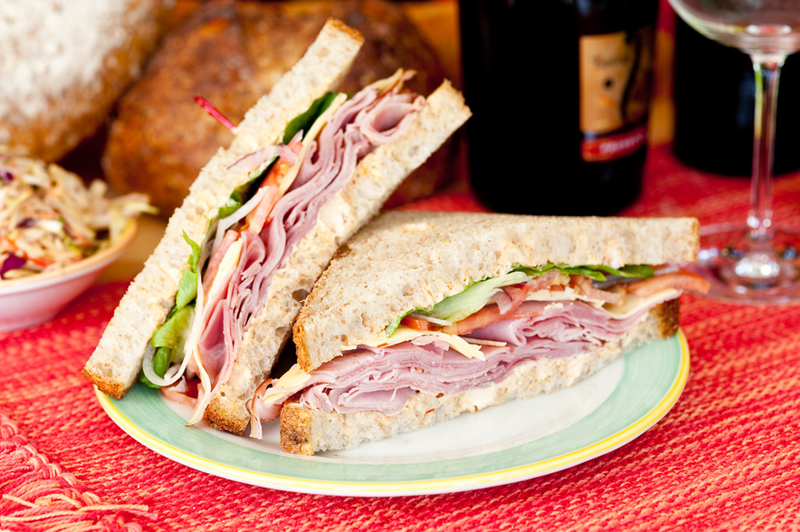 Anyway most sandwiches were made at home, or put together on demand in a cafe or pub. Then in early 1980 the Big Idea arrived when triangles of white bread in plastic cartons turned up in Marks and Spencer. Those early offerings were nothing fancy – salmon and cucumber, or egg and cress. Prices started at 43p. They were probably looked on as something you picked up while you were shopping, to give you an easy lunch when you got home. But it wasn’t long before they caught on with office workers. Cut to today and you’re a bit spoiled for choice on the high street for a quick and easy lunch you can/must eat at your desk. The fact (well, statistic anyway) is that the sandwich still rules as the nation’s favourite quick bite (less than 3 minutes usually). Talking about choice – Pret a manger are currently offering crayfish and avocado, and curried chickpeas and mango chutney along with more prosaic combinations. But apparently the most popular sandwich in the UK is still ham and cheese. So not much change then from 1851. Before I leave the subject I ought to mention what might qualify as the world’s most expensive butty which is apparently still on offer at Selfridges. It’s named after its creator, chef Scott McDonald (no relation to Ronald). It’s made with wagyu beef, fresh foie gras, black truffle mayonnaise, brie de meaux, rocket, red pepper and mustard confit and English plum tomatoes. They don’t specify the bread but it’s probably not Mother’s Pride. At £85 it won’t be on sale in Starbucks any time soon. But is it really that much better than a 43p salmon and cucumber sandwich from M&S? Well, just a bit, maybe. And the Mayfair pub? Well you’ve had a clue. It’s easy enough to find.